When ideas of library neutrality seek to disentangle libraries from the lives of patrons and the politics of the time, there are librarians who demand action and advocacy. This lecture will discuss libraries documenting social movements through participatory community archives and the activist practitioners hoping to disrupt systems of oppression that also exist in the field of LIS. 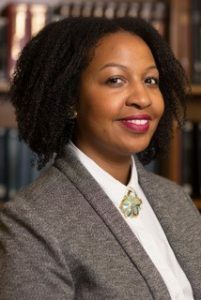 Makiba Foster is the Assistant Chief Librarian for the Jean Blackwell Hutson Research and Reference Division at the Schomburg Center for Research in Black Culture. Prior to her role at the Schomburg, she lead collaborations at Washington University in St. Louis Libraries focusing on community archives and social justice work. Documenting Ferguson, a community sourced digital archive and Mapping LGBTQ St. Louis, a Mellon Funded GIS mapping project, are examples of this work. She is active in state and national library associations and she has authored articles published in Library Journal and Library Management. The School of Library and Information Studies and the College of Communication and Information Sciences at the University of Alabama are excited to sponsor this free lecture that is open to the public. Coffee and dessert will be provided. A promotional flyer for Ms. Foster’s visit in attached below for distribution. We’re looking forward to seeing you there!